If you could eat one thing for the rest of your life...what would it be? My mom and I had a conversation about this over dinner a while ago. We made a nice dinner spread which included ca kho (fish braised in caramel sauce), dau hu chien (fried tofu), and canh kho qua (bittermelon soup). We both agreed it was the best meal EVER, and could literally eat it everyday. Things got semi-serious when I asked her what she would eat if she could only eat one dish for the rest of her life. She said hands down it was ca kho. Then it was my turn. First I picked Bun Bo Hue, then I changed it to Canh Chua, and then it was Bo Luc Lac. I thought about it for days. I finally decide that I can seriously eat banh trang cuon (summer roll) for the rest of my life. 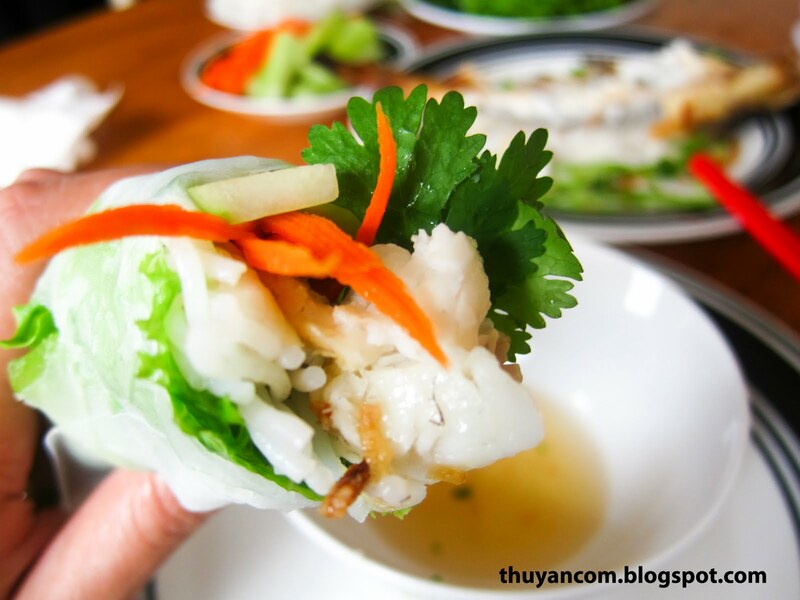 With good fish sauce, anything rolled in rice paper will be satisfying. My protein of choice is definitely fish, baked fish! Simplicity is key to baking the perfect fish! You just want to lightly salt both side of the fish. Brush a little oil on your cooking sheet so the fish doesn't stick and fall apart. Bake the fish in the oven at 375 degrees. I don't really have a set time, just until both side become golden brown, and the top side I will leave it in until it's crispy. In my family we fight for the crispy tail! 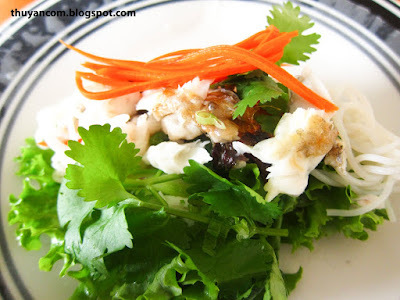 Just before I take out the fish, I will sprinkle minced green onions on top. I don't brush any additional oil on the fish because catfish is oily enough. 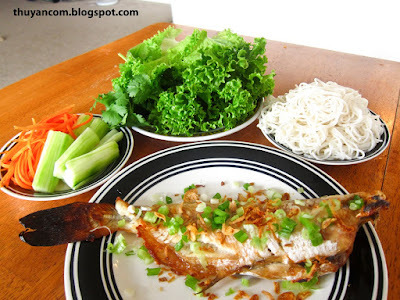 When the fish is ready to serve, I top more green onions as well as fried onions (hanh phi). It's really that simple. Once you combine the fish, herbs, and noodles and drench it in fish sauce, every bite will leave you wanting more. I can sit there and eat 10+ of these rolls! Honestly, I pray I NEVER would be limited to one food item for the rest of my life and wouldn't wish that on my worst enemy. Preparing the Fish: I like to use catfish for this recipe. If it's a bigger fish, you might want to butterfly it. 1. Lightly rub both side of the fish with salt. 2. Pop it in the oven at 375 degrees until the fish has crisp up. 3. Mix one teaspoon of honey with one teaspoon of vinegar and brush it on top of the fish. 4. Pop it back in the oven on broil until the fish is golden brown. The honey/vinegar will form a sweet coating and help achieve more color. 5. Brush the fish with some sauteed green onions and topped off the fish with some crushed peanuts. that looked sooo good - i bought a fish i think snapper. I'm going to try to make this dish soon. Oh my, I have to try this. I tried asking my very handsome husband (Ted, I hope you're reading this) to make one. But I need to do more convincing and help him write a college paper before he says yes. Haha.